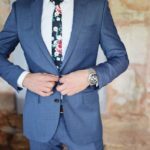 Most guys have a go-to suit that works for a variety of activities and events, but in the warmer months those suits don’t always work as well. For one thing they can be incredibly hot, but for another a dark suit can look extra boardroom when you’re wearing it an event where everyone else is in lighter fabrics and colors. Owning a separate summer suit can be the simple answer to that issue. Here’s what to look for in one. Wearing a suit off the rack in possible, but only if it actually does fit you properly. It might not. Getting your suits tailored to fit you correctly is a great investment that can’t be appreciated enough. You’ll not only look way more put together and stylish, but you’ll also feel more comfortable in a suit that fits right. There will be less bunching and less random fabric to deal with when it fits. Not to mention the fact that the more you like the fit of something the more likely you are to continue wearing it and feel like it was money well spent. Not everyone is going to be immediately comfortable with the concept of a white suit, but it’s totally doable. And even if white will never be your thing you should definitely consider a beige version. The key to wearing lighter colored suits is to pair them with the right items from your closet. The goal is to look chic, not flashy. It’s important to go with a light colored shirt as well, think light blue, white, anything in that category. Your navy blue striped work button down is not going to work with those white pants. However lighter striped shirts work great…but perhaps go with a short-sleeved version. Generally lighter colored suits go best with brown shoes and belts so that there is a more natural flow in the color scheme. The contrast of black can be a bit stark depending on what colors you are working with. Lighter colored suits are just simply going to be more susceptible to stains. When someone spills on a black suit it’s likely to be unnoticeable but even the most unassuming drink splash can leave a mark on a light suit. You might want to consider carrying around some stain remover wipes or a pen in your inner jacket pocket just in case. Of course regular maintenance is important as well, as a lighter suit is going to require more trips to the dry cleaner than a darker suit might. Some linen suits can be washed at home, so if that’s something you prefer you should definitely invest in one of those. Some can handle a gentle machine wash while others prefer a hand wash but either is pretty simple and straightforward. Be sure to rinse the suit completely and then allow it to air dry. Never put a linen suit in the dryer. Drying options include hanging on a padded hanger to retain the shape or laying flat to dry on a towel.